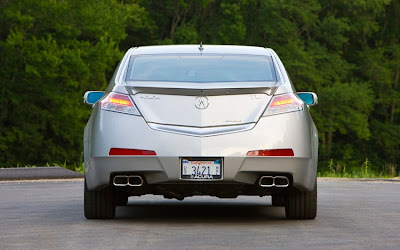 Not like anyone is going to be surprised or anything, but here it is without any sort of camo, the 2009 Acura TL! With dramatic new styling, precise handling and a host of advanced technology and safety features, the fourth-generation TL is Acura's performance leader TORRANCE, Calif. - Since inception, the Acura TL performance luxury sedan has set lofty standards for styling, performance, comfort and technology. Available for 2009 in two distinctly different models, TL and TL SH-AWD®, the all-new fourth-generation Acura TL dramatically expands the model's capabilities and appeal with evocative style, a choice of two VTEC® powertrains (including a new 305-horsepower V-6) and the TL's first-ever application of Super Handling All-Wheel Drive™ (SH-AWD®). Boasting larger dimensions, optimized suspension, a new Sequential SportShift transmission, plus an available Technology Package featuring a comprehensive array of navigation and communication aids, the 2009 TL offers more appeal than ever before. 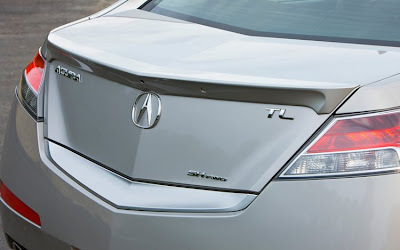 Along with an available Acura/ELS Surround® premium 10-speaker surround sound system and an all-new AcuraLink® weather feature, the new TL is by far the most technologically advanced sedan in Acura's history. 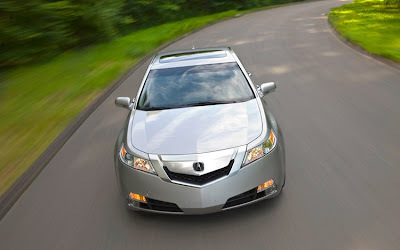 The combination of dramatic new styling, exhilarating performance and an extensive array of electronics (including AcuraLink® real-time traffic and AcuraLink® weather with Doppler-style radar mapping) ensures the 2009 Acura TL will appeal to a sophisticated, technology-savvy audience. A choice of two different all-aluminum VTEC® engines enables the new 2009 TL to satisfy a wide range of customers. 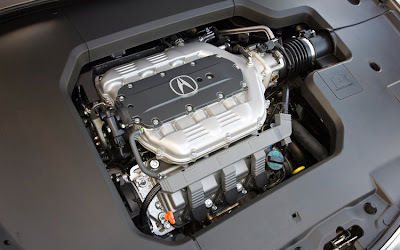 Standard is a 3.5-liter V-6 producing 280 horsepower and 254 lb-ft of torque that sends power to the front wheels through Acura's sophisticated Sequential SportShift 5-speed automatic transmission with steering-wheel- mounted paddle shifters and Grade Logic Control. Though powerful, the new engine is also fuel efficient, with projected EPA fuel economy ratings* of 18 mpg city and 26 mpg highway. The engine is targeted to meet California's tough CARB LEV II ULEV emissions certification standards, thanks to features including a Drive-by-Wire™ throttle system, Computer-Controlled Programmed Fuel Injection (PGM-FI) and Variable Valve Timing and Lift Electronic Control (VTEC®) for the intake valves. Serious performance-sedan devotees will choose the TL SH-AWD® to make winding roads their own. Its all-new 3.7-liter V-6 engine produces 305 horsepower and 275 lb-ft of torque courtesy of greater displacement and additional high-performance features like Variable Valve Timing and Lift Electronic Control (VTEC®) on both the intake and exhaust valves, and a special high-flow dual exhaust system. With projected EPA fuel economy ratings* of 17 mpg city and 24 mpg highway, the 3.7L is also targeted to meet California's stringent CARB LEV II ULEV emissions certification. The pièce de résistance on the TL SH-AWD® is the Super Handling All-Wheel Drive™ system, now available on the TL for the first time. During spirited cornering, SH-AWD® seamlessly distributes more torque to the outside rear wheel to create a "yaw moment" to help the TL turn in more quickly and precisely - while also continuously apportioning drivetrain torque front to rear and left to right. The result is a remarkably balanced and precise all-wheel-drive performance sedan that excels year-round, not just during inclement weather. 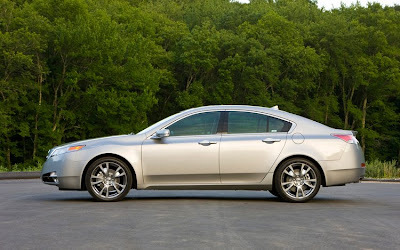 Acura TL's performance achievements extend to durability, reliability and refinement as well. Both engines feature electronically controlled engine mounts to reduce engine noise, vibration and harshness (NVH); quiet and efficient Electric Power Steering (EPS) and maintenance-free serpentine accessory belt also boost operating refinement. A standard Maintenance Minder™ system and up to a 100,000-mile tune-up interval offer further time and cost savings for the TL owner. The standard transmission on the 2009 TL and TL SH-AWD® is a Sequential SportShift 5-speed automatic featuring F1®-style steering-wheel mounted paddle shifters and Grade Logic Control. Merging the convenience of an automatic with the enjoyment of SportShift manual gear selection, the transmission also features an overdriven top gear for maximum fuel efficiency on the highway. 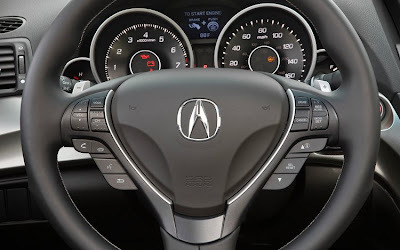 In fact, the Acura transmission has the widest gear-ratio spread of any 5-speed transmission in its class, providing strong acceleration in lower gears and relaxed, fuel-efficient highway cruising. Major improvements in structural engineering for the unit-body further define the 2009 TL. The list of substantial changes begins with the relocation of frame rails inside (rather than underneath) the vehicle's floor pan, resulting in a nearly flat body underside. Benefits of this design include improved crash safety, a significant reduction in interior noise levels, and reduced aerodynamic drag that helps enhance fuel economy. Another significant improvement is the increased use of high-strength steel, which simultaneously improves the unit-body's overall strength while helping to reduce weight. For additional weight savings, aluminum is used for the hood, the front suspension subframe and rear suspension knuckles. 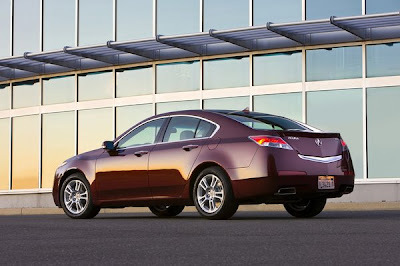 Ride quality and passenger comfort benefit from the 2009 TL's larger exterior dimensions. Featuring 6.0 inches greater exterior length, 1.8 inches more overall width and Ride quality and passenger comfort benefit from the 2009 TL's larger exterior dimensions. Featuring 6.0 inches greater exterior length, 1.8 inches more overall width and a modest 0.5-inch increase in overall height, the TL is noticeably larger than its predecessor. The larger body size directly contributes to greater interior roominess; it also allows a 1.4-inch longer wheelbase to improve ride quality and a significantly wider track (1.1 inches wider in front, 1.8 inches wider in the rear) helps generate even more tenacious cornering power. The TL employs a double-wishbone independent front suspension and a multi-link independent system in back. Further improving ride quality and road-holding are new dual-stage "blow off" style hydraulic suspension dampers, new hydro-compliant bushings (used to mount the transmission and key suspension components) and a new "smart" engine mount design. On the Super Handling All-Wheel Drive™ (SH-AWD®) model, more performance-minded suspension and brake tuning, larger wheels/tires, racing-inspired front brake cooling ducts, and specially-tuned Electric Power Steering (EPS) take the enthusiast's driving experience to an even higher level. An evocative and powerful exterior body design dramatically advances the TL's image as a performance luxury sedan. Designed by Acura in Southern California, the TL utilizes an array of styling techniques to express motion - and emotion - even when the car is at rest. 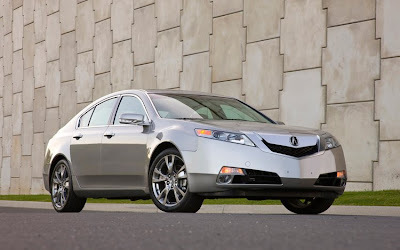 Featuring Acura's new signature front grille, body sides defined by strong character lines, sweeping C-pillars and new LED taillights, the 2009 TL is simultaneously Acura and yet wholly unique. Plentiful use of luxury and performance features add visual appeal while adding to the TL's vigorous statement - including bright HID projector-beam front headlights, pronounced wheel arches, a standard power moonroof and genuine stainless-steel body trim. Wheels and tires are as expressive as the exterior styling. Standard on the 2009 TL are 17-inch aluminum wheels with P245/50R17 all-season Bridgestone Turanza or available Michelin Pilot tires for confident year-round performance. The TL SH-AWD® comes with 18-inch aluminum wheels with lower-profile P245/45R18 Michelin Pilot tires for more agile handling. Finally, the TL SH-AWD® offers available 19-inch aluminum wheels with aggressive P245/40ZR19 Michelin Pilot Sport PS2 summer tires for the ultimate TL performance experience. 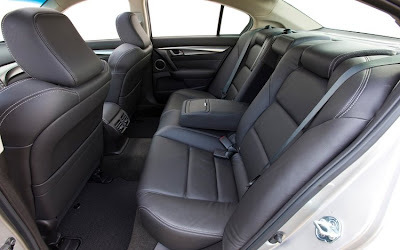 In keeping with its mission as a driver's car, the 2009 TL interior features a new "dual personal" layout that provides both the driver and front passenger with their own personal space. Thanks to its larger exterior dimensions, the new TL has 1.3 inches more rear legroom and 0.5-inch of added rear shoulder room compared to the previous generation TL. Acura's commitment to luxury and technology becomes apparent from the first moment the driver's door is opened. With sweeping shapes, generous use of premium materials and passionate attention to detail, the TL rewards the discriminating eye. The design and execution of the interior is an artful combination of leather surfaces, accented by metallic and wood-pattern trim. An impressive array of premium standard features includes a power moonroof, dual-zone adaptive climate control, 10-way adjustable (8-way power seat with 2-way power lumbar support) driver seat, 8-way adjustable power front passenger seat, and steering-wheel-mounted F1®-style paddle shifters for the Sequential SportShift automatic transmission. An 8-speaker, 276-watt audio system that includes a 6-disc CD changer, AM/FM radio, XM® Satellite Radio, Bluetooth® Audio, USB port and AUX jack connectivity, and HandsFreeLink® wireless telephone interface are standard. Available on both the TL and TL SH-AWD® is a Technology Package that includes the most comprehensive array of advanced electronic features ever offered by Acura. The Technology Package includes the Acura Navigation System with Voice Recognition™, AcuraLink® real-time traffic, AcuraLink® weather with Doppler-style radar mapping, an Acura/ELS Surround® premium audio system and Keyless Access System with pushbutton ignition. The included Navigation System features a new 8-inch full VGA high-resolution color display for improved visibility. Audiophiles with appreciate the new Acura/ELS Surround® 10-speaker, 440-watt premium sound system with DVD-Audio, CD, DTS™, AM/FM radio, XM® Satellite Radio and 2,500-song** hard disk drive (HDD) media storage. An intuitive interface dial as well as sophisticated voice recognition capability simplifies control of this impressive technology. Premium Milano leather seating surfaces included in the Technology Package further enhances comfort and visual appeal. Advanced Compatibility Engineering™ (ACE™) represents a major advance in structural engineering for the 2009 TL. In simple terms, ACE™ better dissipates crash energy in a severe frontal collision through the use of dedicated load-bearing frame structures that efficiently distribute crash energy through the body structure—while also helping to preserve the integrity of the passenger compartment. 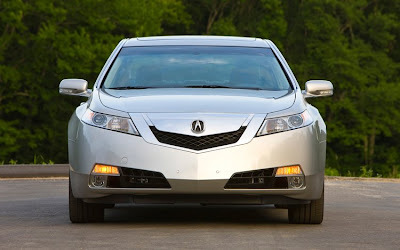 Acura first introduced ACE™ to the Acura line for the 2005 model year and its inclusion in the 2009 TL means that every vehicle in the Acura model range now has this advanced safety engineering. Six airbags and a new Active Head Restraint System for the driver and front passenger headrests top the long list of passive safety features built into the new TL. The airbag array includes dual-stage, dual-threshold front airbags, new dual-chamber front seat side airbags with front passenger seat Occupant Position Detection System, along with side-curtain airbags for all outboard seating positions. Additional passive-safety features include 3-point seatbelts and head restraints for all seating positions, driver and front passenger seatbelt load-limiters with an automatic tensioning system and a Lower Anchors and Tethers for CHildren (LATCH) system that permits quick, secure attachment of up to two child seats in the rear seating area. The new TL includes sophisticated active safety features including powerful 4-wheel disc brakes (with ABS, EBD and Brake Assist), Vehicle Stability Assist (VSA), Tire Pressure Monitoring System (TPMS), all-season tires and an available SH-AWD® system. Adding to the list of standard exterior safety features are daytime running lights (DRL) along with 2.5-mph front and rear bumpers. 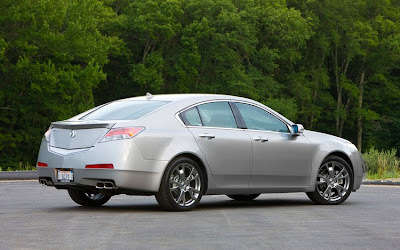 The 2009 Acura TL is designed to meet the latest crash-safety regulations, including the new FMVSS214 side crash standards (which the TL meets three years early) and the new FMVSS301 rear crash standards. Internal testing indicates that the 2009 TL should achieve the highest ratings in National Highway Traffic Safety Administration (NHTSA)*** and Insurance Institute for Highway Safety (IIHS) crash tests. 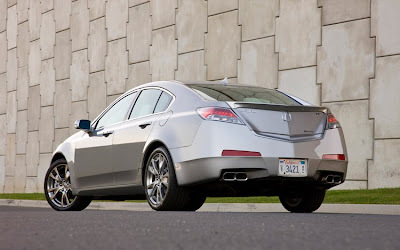 The 2009 Acura TL is assembled in Marysville, Ohio and is covered by a comprehensive 4-year/50,000 mile bumper-to-bumper limited warranty and a 6-year/70,000 mile powertrain limited warranty. Additional benefits of ownership include Acura Total Luxury Care (TLC), which provides free 24-hour roadside assistance, concierge service and trip routing.